Home › FAQ › What Happens at a Campus Visit? What Happens at a Campus Visit? Touring prospective campuses is a defining part of the American college experience, but exactly what happens at a campus visit? Every university puts their own spin on the process, but the basics of a visit are universal. When you visit a prospective college, you will see a classroom, enjoy the school’s dining facilities, tour a dorm room and maybe even see a sporting event. 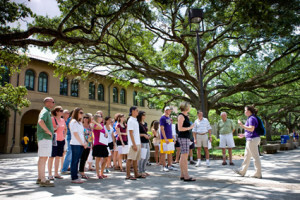 Walking across campus, visiting classrooms and hearing about the programs offered at the university is the key element of a touring campus. You’ll probably follow a student guide for one to two hours and visit every part of the university, from the library to the recreation center. Don’t be shy during this portion of the campus visit; guides want you to get the most of the experience. This is the time to ask all of your questions about the university. Guides are trained on the social, academic and extracurricular features of the school, and they want to customize the campus visit to your interests. Most tours will end with lunch on the university’s campus. Although visiting the dining area is often the most impressive part of the tour for young students, don’t lose sight of the big picture. You don’t want to attend a school, just because it has a free soft-serve ice cream machine in the dining hall. You want a university that focuses on a quality education, not flashy extras like coffee shops or pizza parlors. Don’t be the student who rejects a university, because the dining hall doesn’t serve bananas, and keep in mind that schools with high-cost dining facilities have to pay for them somehow – most often by charging students more, according to the Boston Globe. Some tour programs might arrange a discussion with current students. If you’re lucky, you’ll be able to talk to students in your areas of interest. Take advantage of these opportunities and find out what students like and dislike about the school. Remember that your tour guide only knows in-depth information about their field of study; by talking to current students in your potential major, you can discover information you couldn’t learn any other way. The department you’re interest in might have an amazing study-abroad or internship option, or you could learn that it focuses too much on graduate students and doesn’t offer good resources for undergrads. If you’re planning to live on campus, you’ll want to see what the dorm rooms look like. Many campus tours for freshmen applicants include a visit to a dorm room. Hopefully, you’ll be able to see an actual room that students live in rather than a model room set up by the school. Be sure to ask about quiet hours, social events and dorm policies. Keep in mind that large universities have many different dorm options; ask what options are available. Campus visits don’t have to be intimidating. They’re a chance for you to learn about a university and determine if it’s a good fit for you. What happens on a campus visit is up to you; make the most of the opportunity to find the perfect place to spend four years of your life.